Irish Rock Discography: Yeah! Yeah! 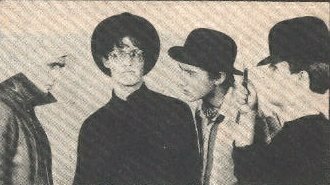 New Wave/New Pop Beatles-influenced band formed by the McCormick brothers after the break up of The Modulators in 1980. Immediately after The Modulators came The Jobbys, a Devo-inspired joke/concept band in which both McCormicks and two Modulators roadies Declan Peat (bass) and Ivan O'Shea (later of In Tua Nua, guitar) played unfamiliar instruments (Ivan McCormick played drums), performed with their back to the audience and with buckets on their heads, etc. What began as a joke evolved into Yeah!Yeah! as Declan began to excell on bass. Ivan McCormick switched back to guitar and Leo O'Regan became the drummer. Ivan O'Shea contined as roadie. 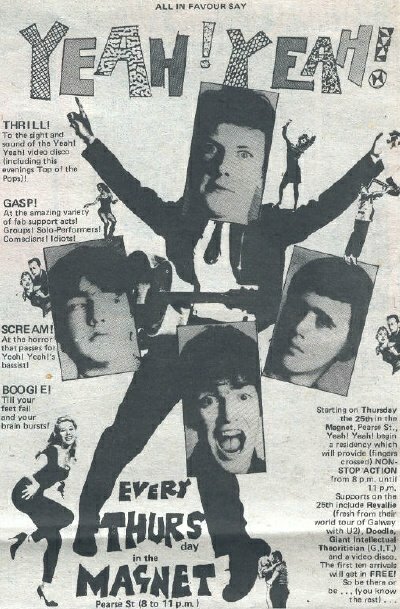 above: advert for February 1982 Thursday night residency at the Magnet in Dublin. Yeah!Yeah! began gigging in late 1980 with a set of new originals. They recorded a 3 song demo recorded at Setanta Studios, Dundalk in early 1981. Leo O'Regan was injured in car crash in the summer of 1981, resulting in steel plates in his hip, but he continued to play drums for the band. In December they supported Teardrop Explodes on their Irish tour. In February 1982 they recorded another demo tape cleverly titled The Tape of Things To Come, and began a residency at the Magnet Bar. Despite showing much promise and positive reviews, the big break never came. They split in late 1982 / early 1983 due to lack of progress and Leo O'Regan's hip requiring further attention. Ivan O'Shea then landed the recording engineer job that had originally been offered to Ivan McCormick at Eamonn Andrew Studios in Dublin. He offered the band the opportunity to record their set and so Yeah!Yeah! reconviened to record 18 songs in one marathon session. Four of these songs are packaged as a demo and sent out to record companies in 1983. Inspired by the new pop of Dollar and ABC, the McCormick brothers began experimenting with synths and exploring the possibilities of 24 track recording on a new mobile studio owned by Peter Eades, who'd worked with The Memories. The rhythm section for these sessions was Jack Dublin (ex Rocky De Valera & The Gravediggers and Paul Byrne (ex Deaf Actor). Dublin & Byrne turned down the offer of permanent places in the band and opted to join Ivan O'Shea's new band In Tua Nua instead. Old live favourites "The Kiss" and "Amnesia" were transformed in new arrangements facilitated by the possibilities of 24 track. Bono was impressed by the results and offered Yeah!Yeah! the opportunity of releasing the first single on U2's new Mother Records label, due to be launched in a years time (after U2 had fulfilled its commitments to the War LP), but the McCormick's don't want to wait a year and turned this offer down. This would prove to be a mistake. Ironically, it was Ivan O'Shea's In Tua Nua, with the Dublin/Byrne rhythm section, who would release the first Mother Records single. The McCormick's continued to record expensive 24 track demos and became involved with some high-powered wheeler-dealer music business executives who specialised in brokering major deals with major labels. Despite the promising demos and much interest from a couple of labels, it all came to nothing, the managers lost interest, and Yeah!Yeah! split for a second time in 1983. The McCormick's moved to London and formed Shook Up! tracks: Tears Turn To Rain / So It's In The Stars / Got Your Picture / Breaking The Lights / Skin And Bone / Say The Word / a.o. tracks: "The Kiss" (frantic jumpy dance track) "Amnesia" (moodily atmospheric, sonically epic ballad) "Say Yeah", "Some Kind of Loving", "Say The Word", "Sleepwalking"
See Also: The Modulators, Shook Up!